You might remember way back in June I had my first attempt at heat embossing on glass. (Funnily enough it seems to be my most popular blog post with search engines!) Anyway, we’ve eaten a few more jars of Aldi chutney so I’ve got a collection of lovely square sided jars which are just perfect for this technique. I thought it would be nice to create a few Christmassy candle holders, so I chose a few stamps and stickers to use as templates. 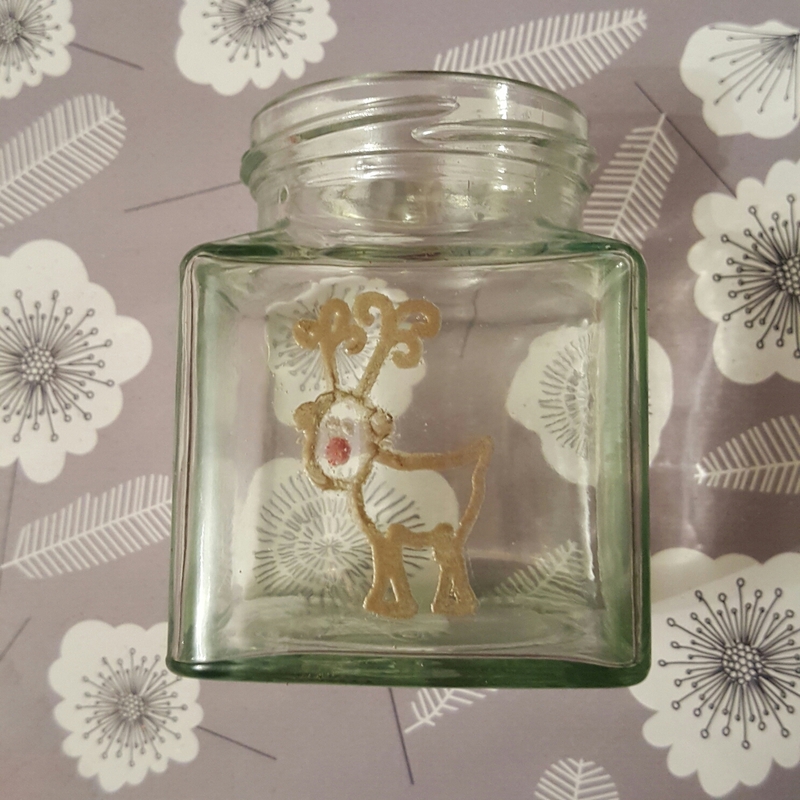 I used my own instructions from my heat embossing post for how to do this, cutting pieces of card to fit the inside of the jar and stamping on to them to use as templates. It would be pretty tricky to draw freehand as the pen is transparent. I still maintain that simple designs work best, particularly since the melted embossing powder spreads and so any fine details risk being lost. 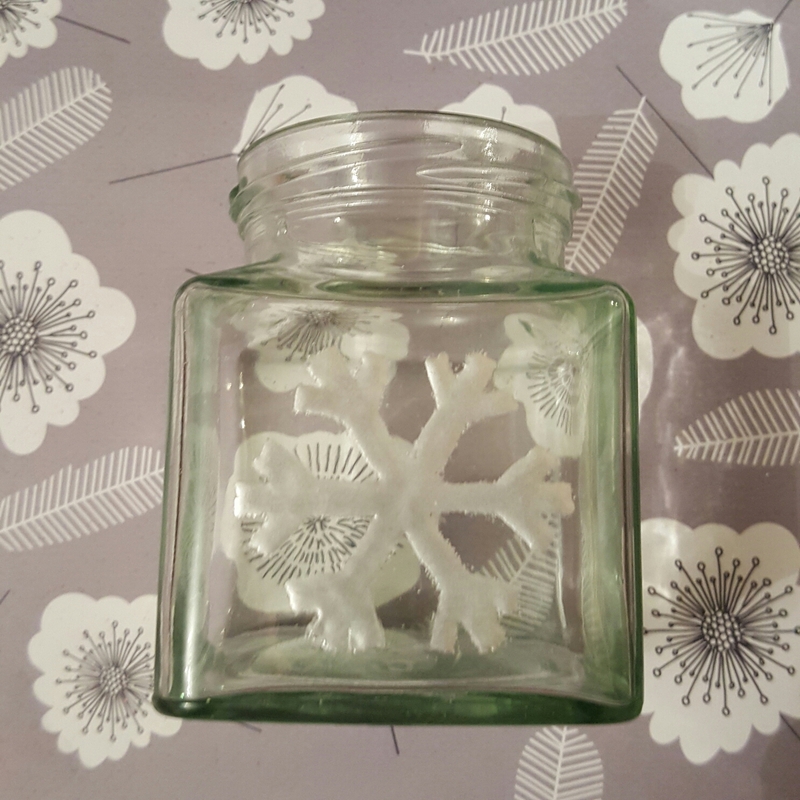 For my first jar I used a snowflake sticker to trace over. 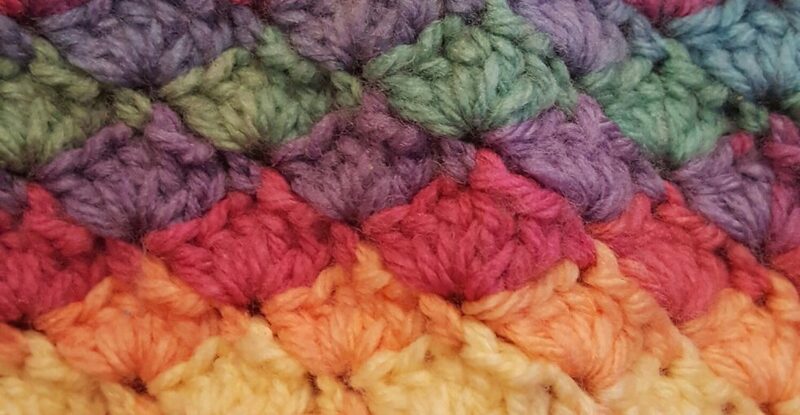 It was a bit chunky so it didn’t result in a beautiful delicate and elegant image. I worked on it in three stages, first I traced the outline and embossed it. Then I filled it in with the Ranger pen and embossed again, before filling in any tiny missing areas and heating it a third time. I was a little concerned about overheating the powder and burning it but it reacted differently on glass as it isn’t absorbent. This meant the result was actually OK. It doesn’t have the finesse I am aiming for but it was good to learn that you can heat the same powder up a couple of times without destroying it. Next time I will find a prettier snowflake! For my next experiment I decided to see if I could use two colours of powder by drawing on the elements in one colour, embossing and then repeating the process with the other colour. I chose a reindeer for this one, it’s a bit more ‘Christmas Day’ than ‘general winter’ but Rudolph’s red nose was the perfect thing to test my idea out on. I used a stamp from an ancient stamp collection and traced the reindeer using the bullet tip Ranger pen. I embossed it in gold, then allowed it to cool. After that I drew on the nose and added red embossing powder. 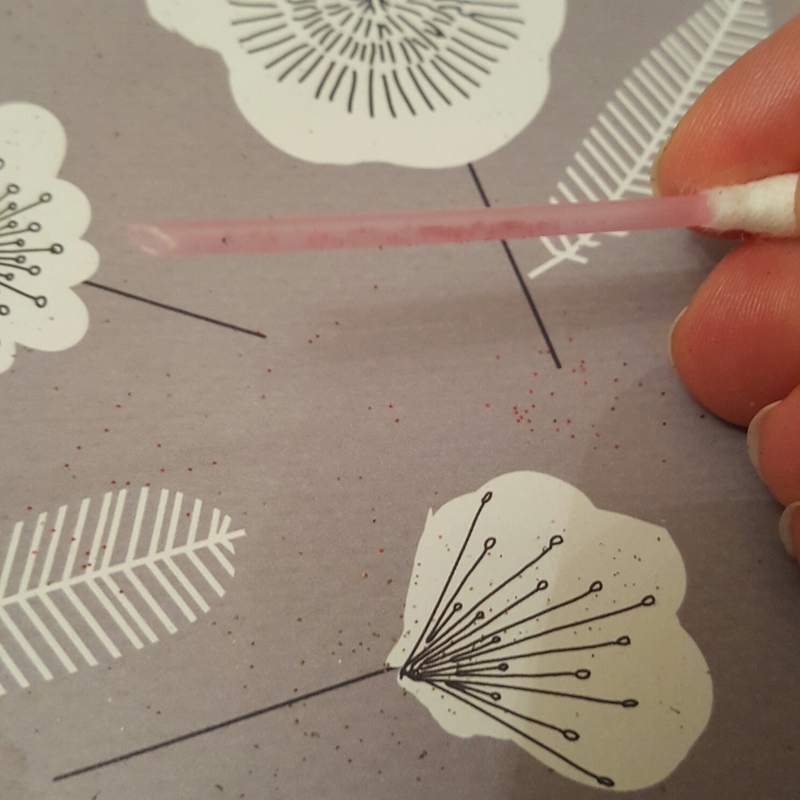 Because the powder can tend to leave little flecks on unwanted areas of glass (even after careful cleaning) I made a very technical tool to add powder to precise areas. I’ve fondly named it the mini shovel. It is actually just a cotton wool bud cut off on the diagonal. I then trimmed off a tiny bit of the point and used it to scoop up little bits of embossing powder. Cheap, cheerful and just the job! Here’s Rudolph! Now I know I can emboss using two colours I’m going to expand my repertoire a bit and look through my stamp collection to find suitable images for more heat embossing. I was going to make iridescent embossing powder snowy cottages. Sadly it turns out someone had put iridescent glitter in the embossing powder section of our discount craft store and heating it didn’t do much at all (it was an unlabelled bottle, just like all of the others). Not to worry, I still have silver and gold. I love these little candle holders. They are so simple to make once you’re used to the method and have everything prepared. I think they’d make fab gifts for teachers, just imagine them with a Festive scented Yankee candle in and a cute tag tied on with baker’s twine. I’m planning to make a few more now. What other seasonal images do you think would look lovely heat embossed onto glass? I’d love some more inspiration! Those are lovely!! How clever 🙂 You could do some holly leaves, or even a little stylised tree…SNOWMEN!! I will. I only have one jar left, but Mr Craft does like a cheese and chutney sandwich so I’ll tell him to eat more so I can have extra jars! They are! I may resort to using round jars too. Very cool! I live alone and am a clutz, so I stay away from anything requiring heat. You make it seem so easy, though. Don’t be giving me any ideas! Well, next summer I’m planning to move close to my mom. We can try it together, for safety’s sake. I love this-how lovely! You always impress me. You are some artist! You are so welcome and they surely will! A one continual line SQUIGGLE. Randomly (but with care) squiggle all over the jar, but not too close together so that the squiggle line doesn’t run into another part of the squiggle line. Emboss in gold and it should glow, but difuse the light. These really are a great idea Mrs. Craft. I can see a line of these, running down the middle of the table on Christmas Day. Brilliant. Oh and .. Aldi chutney … it’s LOVELY! Likewise their Potatos au Gratin, and … if you haven’t tried it, their boxes (plastic with a peel back lid) of Ham Trim. So, so lovely, and more often than not you’ll end up with whole slices and not trim at all. These are so cool, now wonder it is a popular post. Love the little reindeer. I also thought of snowmen or trees, Same as Samantha. Or how about a Wise Man, King or even a stable? Just as a shadow or silhouette? Might look good with the light. Or stars? Holly? This is a great idea! I vote for stars as well, or diagonal red lines so it looks like a stripey candy cane. Have fun! 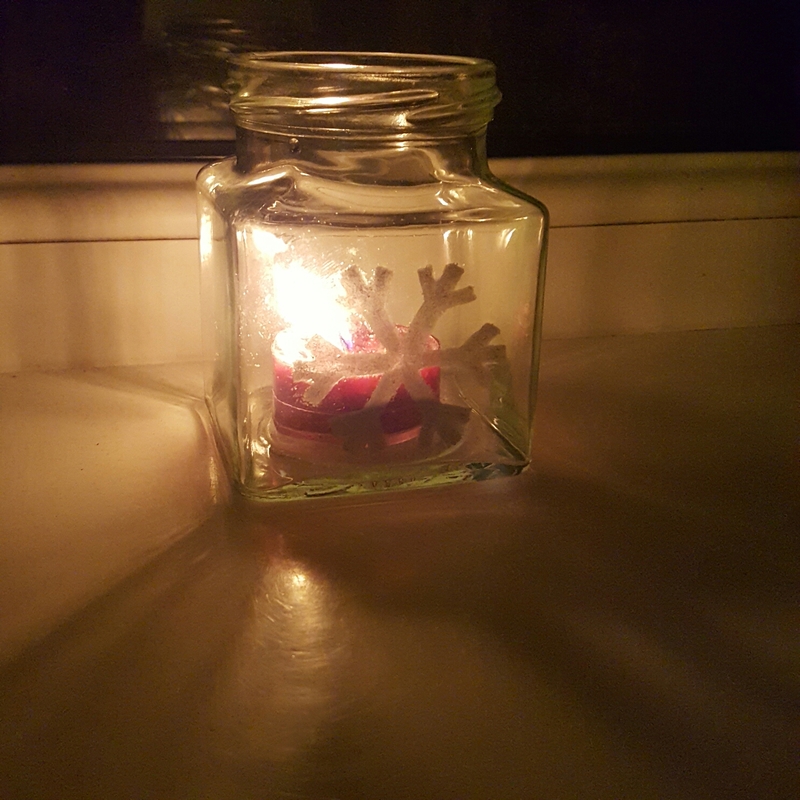 The snowflake looks really effective with the candle, MrsCraft!